As the cost of technology reduces, the technology built into electric toothbrushes increases and improves. A feature that has been present for a while on some brushes as a result of these advances is a pressure sensor, which is one of the features we recommend having in our electric toothbrush buyer’s guide post. A pressure sensor in respect to electric toothbrushes are small components inside the brush handle that detect when you are applying too much force during your brushing routine. When it detects the use of excessive pressure, the brush will in turn do something. What it does depends on the model. The bristles of the brush should skim the tooth surfaces to sweep away, bacteria, food debris and plaque. Hard and aggressive brushing will not normally help, hence the pressure sensor to alert you to these instances where you do apply too much force. What happens when I brush too hard? The effects on your teeth and gums may not be instant. It depends on how much pressure, for how long and your mouth as to how your body will react. Needless to say a brush head that is moving at a reduced speed is not as effective as cleaning and if it is fighting against the pressure it can be rubbing against the tooth and gum rather than the desired skimming, which can only cause potential damage to the teeth, wearing away the enamel. Exactly what happens to your toothbrush when you brush too hard depends on the brand and model of brush you have. The most basic electric toothbrushes do not have a pressure sensor and do nothing, so if you are brushing too hard, you could be doing damage. Some basic brushes do have a pressure sensor that when activated will reduce the amount of power delivered to the brush head in order to reduce the chances of ongoing damage to the teeth and gums. If the excess force is removed, the motor will power back up to a fuller speed and perform as normal. This change can happen within split seconds. More advanced models will not only reduce the motor power but will alert the user by switching on a light on the brush, quite often a red warning light found at the top of the brush handle. This comes on as soon as too much pressure is detected. It remains on until such time as the pressure is reduced. The most advanced will change the motor speed, illuminate a warning light whilst also sending a message to your smartphone application which is tracking your tooth cleaning. These Bluetooth enabled brushes will often log the amount of time too much pressure was applied for and use it as a way of coaching you to achieve better oral health. In all instances, if you listen you will hear the brush motor change when you apply too much pressure. Perhaps try it briefly just to get yourself used to the different sound of the motor. You will then subconsciously recognise if you brush too hard and stop because you may not only hear the motor straining but subject to your model will likely get some form of alert. Do I get an audible warning? To date I have yet to come across a brush that offers an audible warning when you are brushing too hard, other than the sound change from the motor. Will I learn to stop brushing too hard? I hope so is my answer to this question. Brushing your teeth should be relatively effortless. When using an electric brush, let it do the work, you just move it to the correct position, as highlighted in our article how to clean your teeth. Normally, if you are finding you are brushing too hard and have a brush that alerts you, then within a few days you can usually break that bad practice. For some it may take longer, it’s just a case of learning and reacting. Often within a few weeks you will learn how much pressure you need to apply, and the feature could be considered redundant after this time. Which brands offer brushes with pressure sensors? 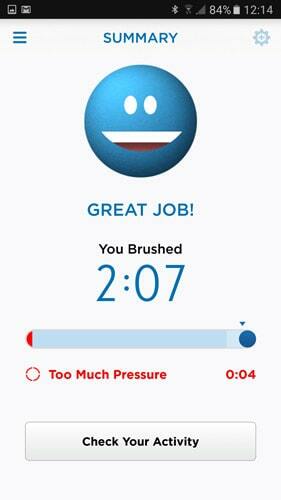 Leading brands Braun Oral-B and Philips Sonicare both offer brushes with pressure sensors built in. It is however Oral-B that have the best range and employ the illuminating light/pressure sensor, whereas Sonicare does not. Which brushes have pressure sensors? The range and models of electric toothbrushes are always changing, so whilst I do my best to keep this list up to date, there may well be other models that offer such. Can I get an add on pressure sensor for my brush? No. This is built into the brush at the time of manufacture. There is no way to add one on. Hopefully you have found this article helpful. If however you should have any questions, comments or queries that you would like answered, get in touch or leave a comment below and I will be happy to help. I am looking for an electric toothbrush the has a pressure sensor with a light that alerts me when I’m brushing to hard, but I don’t want a toothbrush with blue tooth (that’s to techy for me) which brush would you recommend? Whilst I would not suggest paying the premium for a model with Bluetooth if you have no intention of using it. However, other features of a Bluetooth enabled brush may appeal. Just because the brush handle may have it you don’t have to use this if you don’t want to. Which is the cheapest and has got soft bristles? Can you please help me. Prices do vary, but typically it will be the Oral-B Pro 2 2000. Look out for the Pro 2 2000S model. S = Sensitive, this is the softest bristled brush head you can get. You can always buy the Oral-B Pro 2 2000N (that comes with a CrossAction brush head) if that is cheaper and buy the sensitive (also known as Sensi UltraThin) brush head separately. Also worth considering the Pro 2 2500N. Although this normally comes with a CrossAction head supplied, it can sometimes be cheaper than the Pro 2 2000. Thank you very much! I think I’ll go for the 2000s. Which one would you suggest for a 13years old? Thank you again, you’ve been very helpfull. The Pro 2 2000S is fine for a 13 year old too. Glad you are enjoying using one of the Oral-B brushes. We have reviewed a number of kids brushes. It does depend on their age as to what is suitable. The following article we have written on the best electric toothbrush for kids, here.